In today’s video, I discuss what a wife is to do when her husband is going through a midlife crisis. Although this is a very trying time for many women, the key to getting through to the other side is to focus your efforts on not taking his changes personally. Use this time to give him space, unconditional love, and mostly, to focus on yourself. It’s important to know that this is only a temporary phase your husband is going through, and to retain the faith that you will make it through to the other side. Join the Divorce Busting Newsletter group to be included on the latest marriage saving videos and articles, exclusive offers, and updates on Michele’s latest speaking engagements. Now today, I’m going to talk about a very very common problem, a mid-life crisis. I’m assuming that you’re a woman who discovered that your husband woke up one day and his personality was abducted by an alien. Up until that point you thought everything was going okay. You thought you had a pretty good marriage, although not perfect. All of a sudden your husband starts complaining about everything. He starts telling you he’s been miserable for years. And guess what? It’s all your fault. It’s natural for you to take it personally. To be hurt. To be devastated. To be confused. What I want to tell you, is point number one: don’t take it personally. 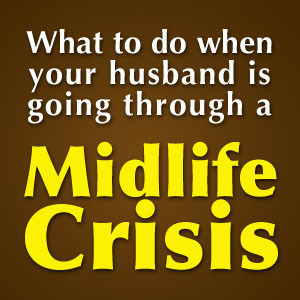 There are lots of reasons a husband can experience a mid-life crisis. It could be because he’s getting to a certain age. It could be because he’s lost a loved one. It could be because he’s lost his job, a major life transition. There are lots and lots of reasons a man might experience a mid-life crisis, and he’s going to blame it on the person who’s sitting across from him – that’s you. You need to take a deep breath, it’s not about you- no matter how compelling his arguments might be. Don’t take it personally. Secondly, please do not debate him. Don’t tell him he’s wrong. Don’t pull out articles from women’s magazines showing him that many men have midlife crisis – it’s not going to help. In fact, the more you try to prove to him that his thinking is faulty, the further you’re going to push him into thinking that he’s right, and the only thing left to do is to leave the marriage. So stop debating. Third point, you need to gather up all of your strength and act as if you know that in the long run everything is going to be okay. The alien is going to give your husband back. He will go back to his normal loving personality. Do the things you would normally do if you weren’t so anxious and you weren’t so worried. Just act as if life is going to be normal again, even if in your heart of hearts you’re scared that isn’t going to happen. Lower the volume on that, just keep going smoothly. It will increase the odds that it will happen. And finally, all of this advice I’m giving you is hard and what you need to do is figure out how you can comfort yourself, take care of yourself. Focus on your life. Get together with friends. Go to church. Go to temple. Read self-help books. Meditate. Exercise. Take care of yourself. The path to coming out the other side of a midlife crisis, it may take a while, it will take strength. You need to be strong, so take care of yourself and you can get there. This entry was posted in Uncategorized, Video and tagged affair, divorce, husband midlife crisis, infidelity, marriage problem, marriage turmoil, mid-life crisis, Midlife crisis. Bookmark the permalink.